With our s imple tips you can adjust the balance, restore and strengthen the missing sector. We will give you some certain examples to make it easier to understand, what to do and how. 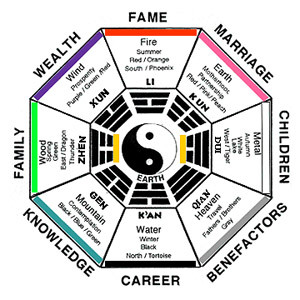 Feng Shui gives you a choice: you can either add the missing areas outdoors (due to external adjustments), or repair and strengthen them in the other ways. If in your room one of the corners is directed inward, then this form is bringing a significant flow of the "Sha" energy deep inside the living space. When you sleep, relax, eat on the way of this thread, you probably can not expect a pleasant dreams or any productive work. The same applies not only to the corners, but also to the rafters. It was noticed long time ago that if the bed is located under the beam, then the person, who is sleeping on this bad will become ill. And especially at a great risk would be precisely those parts of the body, which are directly under the flow of the pernicious "Sha" energy. In these cases, you can use the artificial lighting. At that very corner, put a floor lamp or a table lamp so that the angle itself will remain in the shadow. If it will not be visible, then the danger of "Sha" will not threaten you anymore. As you can see, it's quite simple. If in one of your rooms there is a particular sector of Ba Gua missing, you can activate the missing zone in the other room by accessible means. To do this, you can perfectly use the indoor plants and lighting. You can restore the missing sector by placing a large mirror on the border zone. Thus, the mirror is "eliminating" the wall on which it is located, making it as if it was transparent. The part that will be reflected in the mirror, will "add" the missing sector. But it's worth noting that the overreaction with the mirrors is not recommended, especially for the bedrooms and children's rooms, it may cause sleep disturbances and nightmares. This is one of the most labor-intensive methods, but it is definitely worth all your efforts. You need to go out and "paint" the missing sector. You can plant some flowers or a lawn grass so that it geometrically will "add" your missing Ba Gua sector. Thus, it will turn out that the building has finally the correct form. If you are able to show philanthropy, at this area you can put the baby swing, toy house and a sandbox: children, their laughter, their joy will attract a lot of beneficial "Qi" energy to your home. And from the "higher powers" you will receive a gratitude, which will perfectly compensate all your expenses.